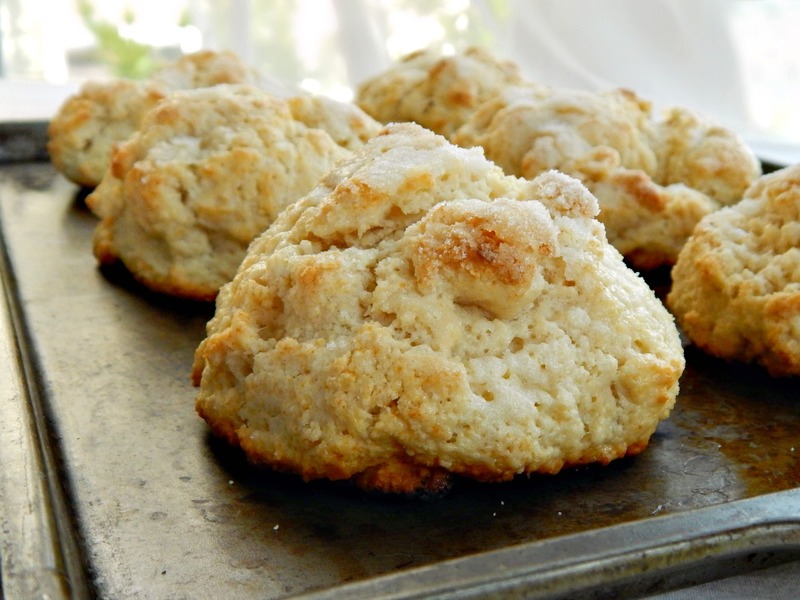 This is absolutely my favorite recipe for a shortcake – the drop biscuit kind. Really almost a scone, and close in flavor to a cream biscuit. We hope for left overs after Three Berry Shortcake so we can gobble these up for breakfast. They may, at first glance, look like a Bisquick thing but believe me, they aren’t. Shortcakes – a cross between a scone and a cream biscuit these are amazing. When I serve this to most people, they don’t expect it to be so fantastic and it’s fun to watch their eyes light up with surprise and pleasure at the first taste. And when that taste is accompanied by sound effects…and isn’t that what keeps us cooks going? A thousand criticisms are erased by one single moan. Super simple to make in the food processor, they’re not much more difficult to make by hand. The key – do not overwork – anything. They should just hold together. Do not doubt…just proceed. Please see Three Berry Shortcakes for our favorite way to serve these during any summer Holiday – it’s the perfect Red, White and Blue dessert. The shortcakes are also wonderful eaten as scones, either baked with a fruit like a blueberry or a dried fruit like raisins or currants. Although this recipe makes six huge shortcakes, I often divide them into 8 and bake just a few minutes less. Place flour, salt, baking powder and sugar in a food processor. Cut the butter in half, then in small pieces. Add to flour and pulse, carefully, several times. You want large pieces (about the size of a pea) left. Gradually add milk while pulsing. Stop when it still looks crumbly – it shouldn’t be totally mixed at this point. Place on baking tray in mounds. Do not attempt to smooth out, they should be “clumps” – lining the tray with parchment or foil helps with clean up. Brush tops with milk or cream – just use a little from the whipping cream you’ll use to serve with it. Sprinkle with sugar. Bake at 450 degrees for 15 – 17 minutes. Do not overbake – better to sacrifice a little browning than to have dry shortcakes. Watch carefully. I often turn the tray halfway through. Cool on a rack and store in an airtight container. These are best the same day, but still good the next. The crispy exterior tends to soften with storage. Oops – I’ve overworked dough in food processor – see the large clumps! Pull crumbles together and schmear with heal of hand. This dough is done. This dough could be patted into a rectangular shape or rolled and cut with a biscuit cutter, but here’s why I prefer them in their rustic form: Shortcake is a sturdy, but delicate concoction all at the same time. Every time this dough is manipulated, it goes a bit from an extremely moist, tender crumb inside to a bit sturdier, less airy and more compact crumb. I embrace the rustic look and shape because they are so perfect inside. The perfect texture and crumb, moist throughout, and absolutely the best, ever, shortcake. This entry was posted in Click here for Fabulous Food Posts and tagged Desserts, Frugal Hausfrau, Fruit, Shortcakes. Bookmark the permalink. I’m drooling! Pinned and shared. Thanks Kathryn – you can do so many things with them. Peaches and cream comes to mind!